I spend about 3 weeks vetting through 20+ open source monitoring solutions and at the end of the process, the choices had boiled down to few major ones - OMD (best combination of open source plug-ins put together for Nagios), Zabbix, and Zenoss. The main components of OMD are Check_MK, PNP4Nagios, Nagvis, and of course Nagios. Among these projects, Check_MK is the core of OMD that makes Nagios easy to configure, easy to scale, and mashed together all the other popular Nagios plug-ins into one unified user interface. Thus the following comparisons are done using Check_MK as the keyword, but I will also cover how other plug-ins makes OMD project stand out from the competitions. A quick Google Trend search will tell you that Check_MK is up and rising. Together with the Nagios’s community size, you can certainly find custom monitoring plug-ins created by community members and save yourself time from reinventing the wheel. Before you pick any open source tool for enterprise projects, you want to make sure that their code is not stale and the community is vibrant for the years to come. Active community and frequent code updates ensure your questions get answered and fast bug fixes. Free service from Ohloh will give you an overview of those aspects on open source projects. The following comparison charts are created from Ohloh. Check_MK is a clear winner in this chart. 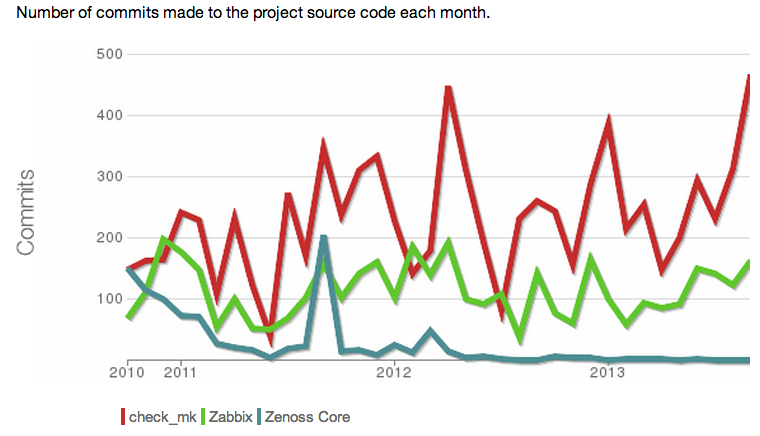 It tells you that Check_MK is constantly making more improvement than the other 2 projects. 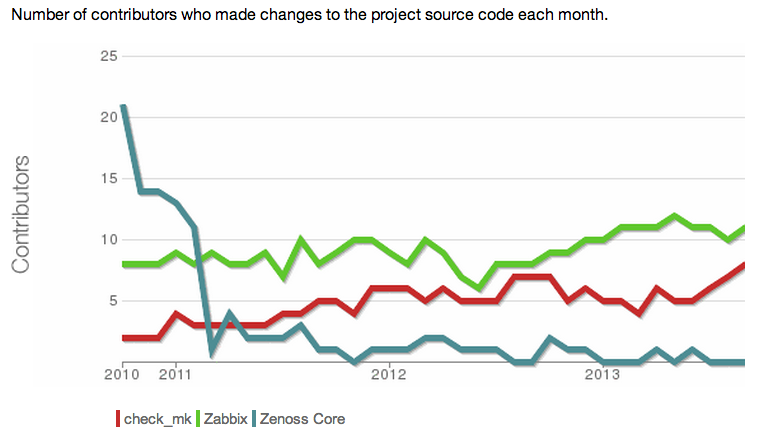 In this chart, Check_MK’s contributor is increasing and will soon surpass Zabbix. And don’t forget it is standing on giant’s shoulder, the largest monitoring community - Nagios. Don’t just listen to me. Here is one of the blog post that talks about why moving away from Zabbix to Check_MK. OMD is a combination of best practices on how Nagios should be setup and integrated. It has incorporated all of the most popular 3rd party Nagios plug-ins in single easy to maintain, easy to install, and easy to upgrade package. 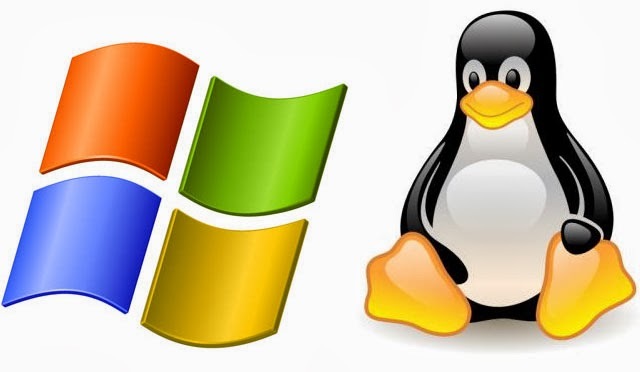 Once you have your Linux server running, installing and have your OMD monitoring suite running only takes about 10 minutes with one command. Administrators can really save time on not having to compile Nagios, or other plug-ins, trying to integrate and mess with configurations between plug-ins and Nagios. It really is a no-brainer to setup and start with. 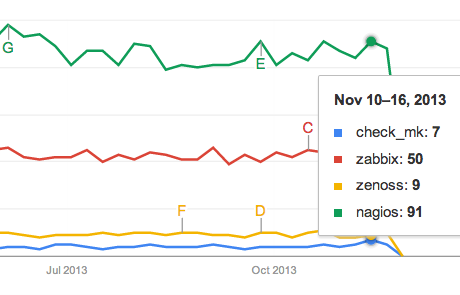 Why use OMD instead of other flavors of Nagios combos, e.g. ? Check_MK is an extension to the Nagios monitoring system that allows creating rule-based configuration using Python and offloading work from the Nagios core to make it scale better, allowing more systems to be monitored from a single Nagios server. There are 2 significant modules that Check_MK uses to improve Nagios performance. One is called Livestatus and the other is called Livecheck. Monitoring results are stores to a single file status.dat. It becomes a bottleneck on CPU and IO for larger installation. status file status is not realtime, default is to update every 10 seconds. NDOUtils utilize databases for monitoring results (MySQL or PostgreSQL), but still have some severe shortcomings. NDOUtils needs a databases to be administered, a rapidly growing one. NDOUtils eats up significant portion of your CPU resources just to keep the database up to date. Regular housekeeping of the database can hang your Nagios for minutes or even an hour once a day. Livestatus also uses Nagios Event Broker API like NDO, but it does not actively write out data. Instead, it opens a socket by which data can be retrieved on demand. Livestatus imposes no measurable burden on CPU at all. Livestatus produces zero disk IO when querying status data. No configuration is needed. No database is needed. No administration is necessary. Livestatus scales well to large installation even beyond 50,000 services. Livestatus give you access to Nagios-specific data that is not available to any other methods. Before Nagios 4.0, Even a perfectly tuned system rarely manages to execute more then a few thousand checks per minute. What make things worse: while your system is getting larger, the maximum check rate is even getting worse. The more hosts and services your system manages, the less checks per second it will be able to perform. Why? The forking of Nagios core (before v.4.0) does not scale on multiple CPUs (single thread process). you can well run into a situation where your powerful 16-CPU server is limited to 100 Checks per second while most of its CPU cores are idle most of the time. It uses a number of helper processes. The core communicate with each helper through a Unix socket (that does not appear in file system). Only a small helper program is forked instead of the complete Nagios monitoring core. The helper forks distribute over all available CPUs instead of single CPU. 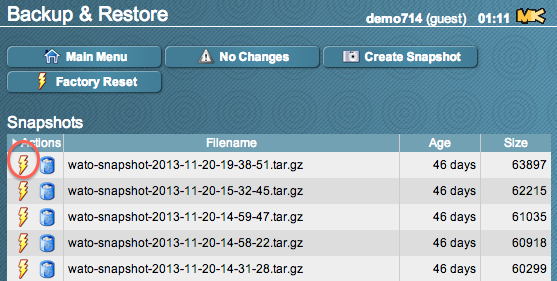 The total process VM size of Livecheck is about 100KB only! 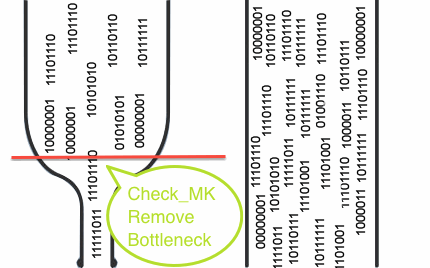 Before inline check_icmp: 300 ICMP checks per second. After inline check_icmp: 2600 ICMP checks per second. The checks generated an ICMP traffic of 45Mb/s. Multisite is part of the Check_MK project as a better web UI alternative for Nagios. 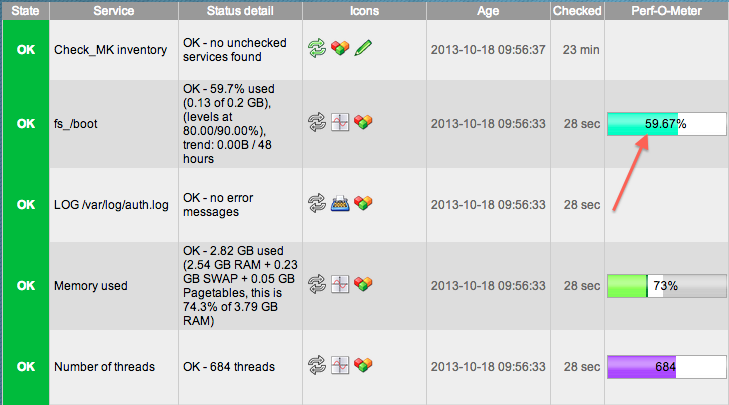 A new and innovative GUI for viewing Nagios status information and controlling your monitoring system. It is based on MK Livestatus and aims at replacing the Nagios web GUI (also known as “the CGIs”). Multisite supports distributed monitoring in a very efficient way. This is one of the most brilliant solutions from Check_MK project to tackle the notorious Nagios configuration disaster. Although Nagios is a flexible and powerful monitoring system, having to mess with its multi-level and confusing configuration files scares many people away. Now, there are many web interface plug-ins that try to take a stab at the issue, but WATO is by far the best that simplify the complexity of Nagios configuration while staying very flexible and more flexible by sitting on top of Check_MK. WATO is a web based administration tool for Check_MK. It allows you to manage your hosts and services to be monitored and perfectly supports Check_MK’s mechanism of inventory to autodetect services to be checked on a host. WATO allows to move a substantial part of the daily workload from the monitoring administrator to his colleagues. NagVis is a visualization addon for the well known network managment system Nagios. 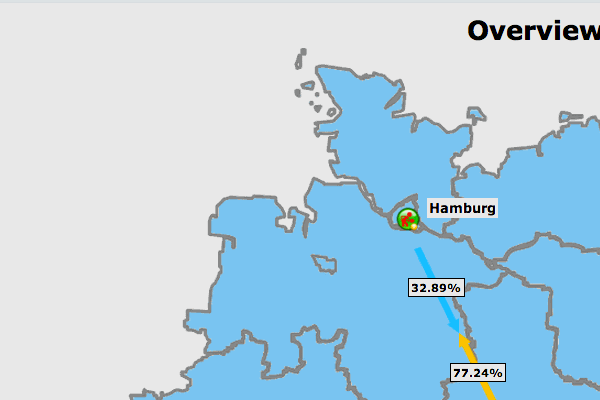 NagVis can be used to visualize Nagios Data, e.g. to display IT processes like a mail system or a network infrastructure. Automation is build into Multisite. You can make web service request against Multisite to automate adding new host, enabling new service checks, or embed any of the host/service check web pages into any other websites. This feature makes it very easy to integrate with Puppet or Chef for automatically adding new servers(hosts) and services to the monitoring system. With Check_MK abstracting the original Nagio’s notification scheme, it has become possible to send notifications of any hosts or services to any number of people at any time. You can even create custom script to send the notification in some creative ways like having the notification be ☎called via a VoIP server to your cell phone and read you the alert message or have the alert be sent to your ✐instant messenger. Distributed WATO allows you to manage several monitoring sites through a logically centralized WATO. I will be sharing how I install OMD, optimized web interface (Multisite), utilized passive checks, implemented 24/7 on call plan, and integrated with automated business processes. I will add link here once they become available. Awesome write up !! Looking at this, I recently implemented it in my current setup and my management is very happy to view its results !! Wow very nice write up and detail. We are debating to switch off Nagios over to Solarwinds at the moment but I might have Management check this review. Download our free IT Infrastructure Monitoring Report and find out what your peers are saying about Nagios, Zabbix, SolarWinds, and more!